I have been working on a series of seascapes, inspired by the amazing light in the Outer Hebrides. The weather is constantly changing and with it the light. The sky and sea dominate the views, and can be anything from bright and sunny to dark and oppressive, with a myriad of variations in between, all of them beautiful and exciting. The series is of the same view and tries to capture the way the sky and sea change during a day. I have been experimenting with recycled metals and Tyvex and the effect of using enamel powders, paints and heat on them. 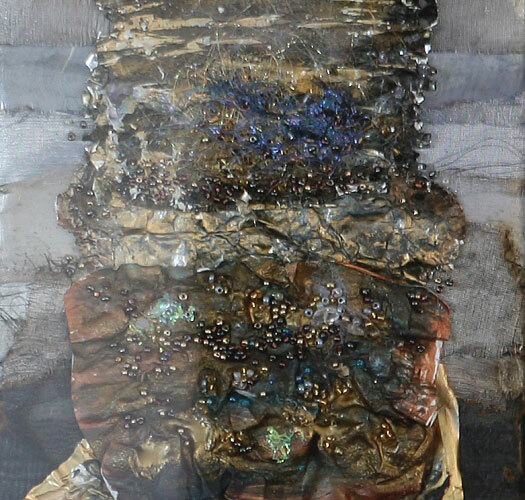 I also use textiles, beads and metal yarns in my work.